With its 2019 Passport, Honda is back in the SUV game. The automaker revived the long-forgotten Passport name ahead of the 2018 LA auto show Tuesday as a new crossover SUV that slots between its compact CR-V and its three-row Pilot. The 2019 Honda Passport will hit dealers early next year with a 3.5-liter V-6 engine and a choice of front- or all-wheel drive. Its bones are shared with the Pilot, but the Passport has seating for five and its body is six inches shorter. At 190.5 inches from bumper to bumper, the new Passport fits in between the Ford Edge and Nissan Murano. Unlike the last Honda SUV to bare the Passport name—a rebadged Isuzu Rodeo sold in the initial SUV boom in the 1990s and early 2000s—the new model’s styling is decidedly sportier. It rides on 20-inch alloy wheels and features chrome touches outside that contrast with unpainted plastic trim. The Passport sits higher off the ground than the Pilot, but the 8.4-inch ground clearance on all-wheel-drive versions hardly makes them rock crawlers. The Passport’s 3.5-liter V-6 is rated at 280 horsepower and shuttles power to the wheels via a 9-speed automatic transmission. The fully independent suspension underneath is paired to a traction control system with four modes for different road conditions on models with all-wheel drive. Front-drive Passports can tow 3,500 pounds, while all-wheel-drive versions are rated at 5,000 pounds. Fuel economy figures for the 2019 Passport haven’t been announced. 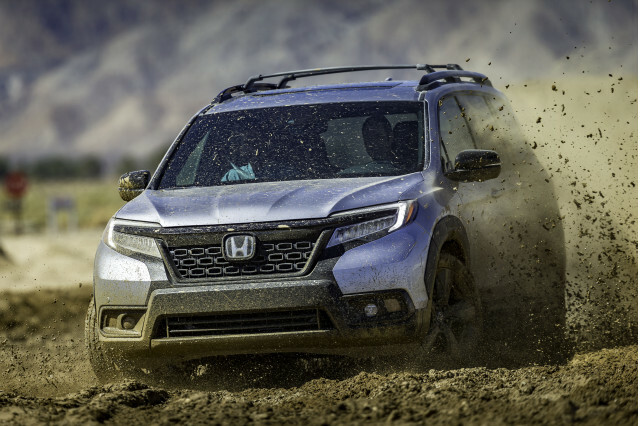 The Honda Pilot is rated at 22 mpg in most configurations; the Passport will likely weigh less, but its higher ground clearance could erase any fuel-savings gains. A stop/start system is standard to reduce fuel consumption and emissions at stoplights. Inside, the Passport uses its space well. It’s rated at 41 cubic-feet of cargo space behind the back seat and a maximum interior hauling volume of about 100 cubes with the second row folded flat. Four trim levels are on offer—Sport, EX-L, Touring, and Elite. That’s a smaller lineup than the Pilot, but Honda tends to be conservative about new products. Passport Sport SUVs feature cloth upholstery, while EX-L and higher trims drape the seats in leather. A 5.0-inch display audio system with two USB ports comes on the Sport, but other versions get an 8.0-inch touchscreen with Apple CarPlay and Android Auto compatibility and more USB ports. High-spec Passports feature a 590-watt, 11-speaker audio system. In the Passport’s instrument cluster, a configurable 7.0-inch TFT display augments conventional gauges. Passport Touring and Elite trims feature a wi-fi hotspot with optional monthly service provided by AT&T. Every Passport features a wide range of active safety tech such as automatic emergency braking, lane-departure warnings, active lane control, and adaptive cruise control. Blind-spot monitors come on EX-L and higher trims. The standard rearview camera system includes an overhead view mode Honda says is useful for attaching trailers. 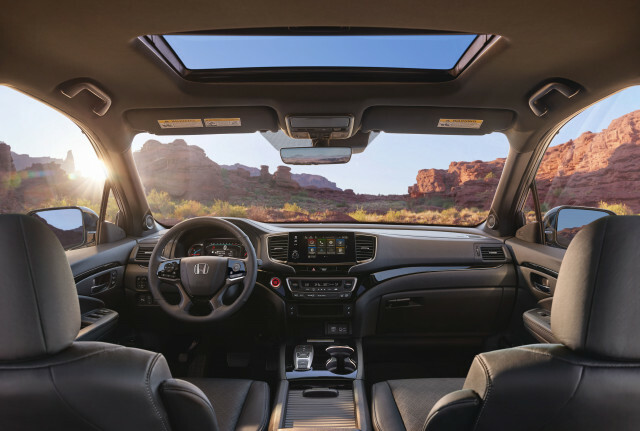 Honda hasn’t yet said how much the 2019 Passport will cost, but even the base Sport is well-equipped with features such as keyless ignition, three-zone automatic climate control, remote start, and LED headlights. The EX-L adds leather upholstery, heated front seats, a power moonroof, a power liftgate, and the more advanced infotainment system. 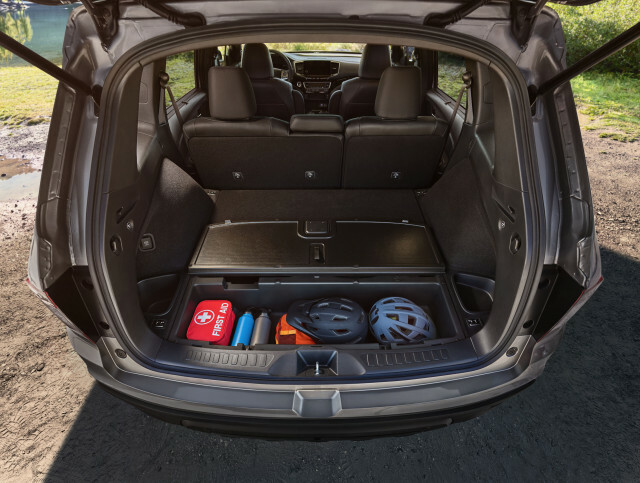 Tourings pile on navigation, handsfree functionality for the power liftgate, a roof rack, insulated glass, and taller tires, while Elites throw cooled front seats, a heated steering wheel, and a wireless charging pad into the crossover.